If a veterinarian has prescribed any medication for your cat in pill form, you may find it difficult to get Fluffy to willingly swallow the dosage. Most often, cats are resistant to taking medication, and as a loving pet owner you cannot bear the thought of force-feeding the pill. If you find that you just cannot get your beloved kitty to partake voluntarily, you can often get her to unknowingly consume the pill by hiding it in her food. Cats, however, can often detect when somebody has tampered with their meals, so you will need to make some preparations to effectively hide the medication. Crush the pill into a fine powder. You can do this using a store-bought pill crusher, or you can place the pill inside a plastic baggy and use a heavy object to crush the pill. Stir a small portion of the crushed pill, no more than a quarter or half of the powder, into a serving of cat food. You will want to use the most pungent cat food that your cat will eat, such as a sardine flavor or liverwurst flavor, in order to mask the odor and taste of the medication. Veterinarian Dr. Ron Hines recommends starting with just a portion of the recommended dosage, rather than the entire pill, in order to let your cat adjust to the taste. Hide the remainder of the crushed pill inside an additional serving of food later in the day. This will ensure that your cat receives the entire dosage without being overwhelmed by the taste of the medication. 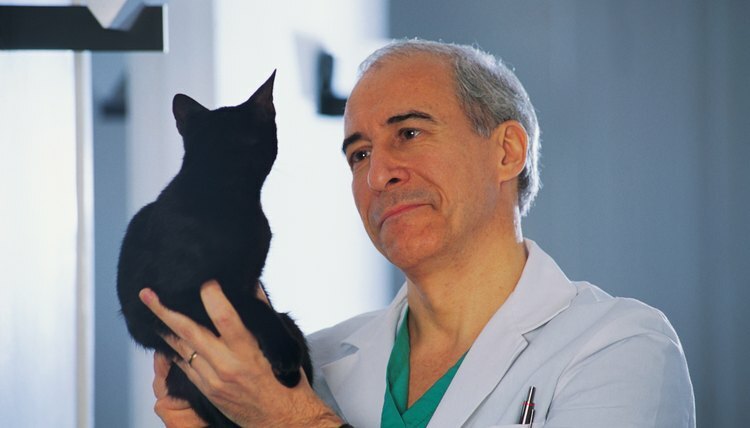 Increase the amount of medicine you mix into the food slightly each day, until your cat will willingly eat an entire dosage with a single helping of food. Serve the medicated cat food at a time when your cat is especially hungry, like first thing in your morning. This will ensure that your cat is less finicky about what he eats and more willing to consume the medication.